The volunteer movement is nothing but active love. This is love for what is most dear. And only such true love brings forth the heroes. This was stated by the Father and the Head of the Ukrainian Greek Catholic Church His Beatitude Sviatoslav at the National Forum "Transformation of Ukraine" during the expanded session of the Coordinating Council of Volunteers on the Day of the Ukrainian Volunteer. The Primate said that the Holy Apostle Paul in his Epistle to the Romans, explaining who is a Christian and how he lives, says: "A Christian is one who lives not under the law, but under grace." "This means that a Christian loves God and his neighbor not because of external coercion, but by the call of the heart. Therefore, we can say that a Christian is always a volunteer," said His Beatitude Sviatoslav. The Head of the UGCC, with pleasure, greeted the volunteers who, following the call of love for Ukraine, responded to this huge task - to stand up for the protection of their people and their state. "The volunteer movement is nothing but active love. This is love for what is most dear. And we know that only such true love brings forth the heroes. Therefore, today I congratulate Ukraine, I congratulate everyone with the gift of great people and heroes, whom we express today honor and glory," said the Primate. "May God bless you generously. I believe in love that overcomes fear. Therefore, I believe in volunteers!" said the Head of the UGCC. An expanded meeting of the Coordinating Council for Volunteers within the framework of the National Forum "Transformation of Ukraine" was held for the first time. 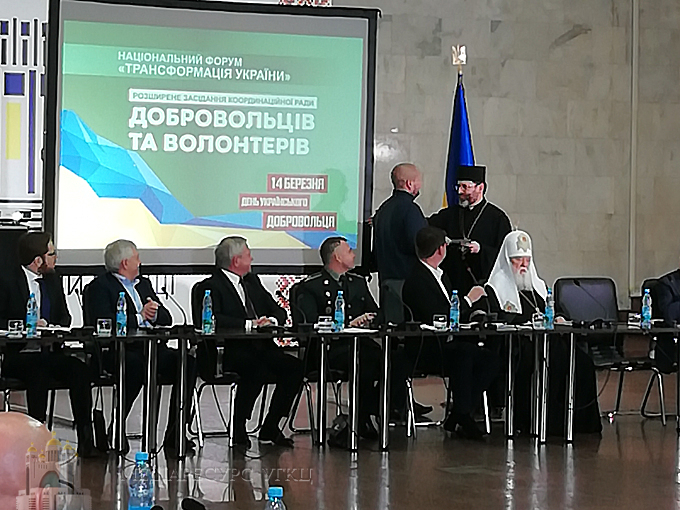 During the meeting, His Beatitude Sviatoslav noted distinguished volunteers and philanthropists: Ihor Kravchenko, Taras Kernytsky, Maksym Shvets, Lyudmila Demyanik and Oleksandr Biletsky by Patriarchal Diplomas. An actual statement was made by Ms. Julia Kirilova, a veteran of the 25th Battalion Kyivska Rus. Speaking about the upcoming presidential election, she urged candidates to accept the results of people's will and not provoke any violence. Her appeal was short: "No violence!"